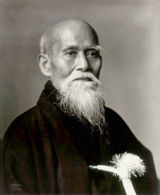 "The secret of Aikido is to harmonize ourselves with the movement of the universe and bring ourselves into accord with the universe itself". "I am never defeated however fast the enemy may attack. It is not because my technique is faster than that of the enemy. It is not a question of speed. The fight is finished before it is begun". Stefan, senior instructor at the AIKIDO CLUB HAMPSTEAD since 1993, began Aikido in the mid '70s. Aikido is a martial art, a brilliant system of self-defence movements, designed to deal with simultaneous attacks by groups of assailants. Both mind and body are trained, promoting fitness, balance and harmony with events.